FREQUENT FLYER™: GO PLACES Peter Erskine approached the DW design team with a novel question,"What if there was a travel kit that didn't sound like a travel kit?" Seems obvious enough, but the minds at DW had never tackled the quandary head-on, as it wasn't a simple task. So they went to work on a kit that was just small enough to be travel-friendly, but also substantial enough to sound like a 'real' drum set should. After, literally, years of R&D and discussion, the sizes were agreed upon: a 12x20" bass drum with low-mass spurs and lightweight ratchet bass drum mount, an 11x14" floor tom with aluminum legs, a traditional 8x12" rack tom with STM, and a matching 5x14" snare drum. 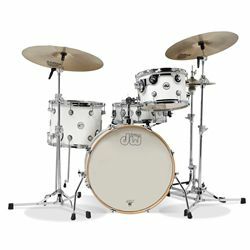 The kit also comes standard with True-Pitch™ tension rods, MAG™ throw-off, True-Tone™ snare wires, and DW Heads by Remo®. The kit is finished in Tobacco Burst Gloss Lacquer FinishPly™. As is the case with all Design Series™ drums, the shells consist solely of North American maple with no reinforcement hoops. Lightweight 6000 Series hardware, including the new Ultralight™ cymbal stand, perfectly compliments the set and is sold separately. Good and the DW Custom Shell Shop in California bring you HVLT™, the same technology that is standard on our latest Collector's Series® Cherry drums. HVLT grain orientation and slightly thicker 1/32" plies of North American maple are a potent combination that delivers a full tonal spectrum, attack, punch, and sonic versatility. Design Series™ shells are tailored for just about every style of music.